We wish to advise that, upon the decision to reduce the company’s capital, USHIO LIGHTING, INC. has concluded a merger agreement with MAXRAY, INC., effective April 1, 2018, as follows. USHIO LIGHTING, INC. is supporting “USHIO America” booth at LDI 2017(Nov. 17-19) in Las Vegas. We are bringing Sai-300 and TAKUMI-2000A at USHIO America booth (#2351). USHIO LIGHTING, INC. is joining upcoming PLASA 2017 (Sep. 17-19) in London Olympia. It will be our first time participating PLASA 2017 and we are very excited to be there. PLASA 2017 is set to be one of the unmissable events around the world. We are bringing our exciting products: 2kw Xenon followspot and LED followspot. We are looking forward to seeing you all. Please come stop by our booth B30!! USHIO LIGHTING, INC. (Chuo-ku, Tokyo; COO/Managing Director: Ryujiro Tsubaki, hereinafter referred to as “Ushio Lighting”), a subsidiary of Ushio Entertainment Holdings, Inc. (Chuo-ku, Tokyo; President and CEO: Shiro Ushio), is pleased to announce the release of Xebex® LED Follow Spotlight “Sai-300” as a new follow spotlight product essential for effective lighting on stage and at hotels, wedding venues, and other locations in mid-May 2017. We are excited to announce that USHIO LIGHTING will be participating ENTECH ROADSHOW 2017. The ENTECH ROADSHOW is a ONE DAY touring pop-up tradeshow that is specifically targeted at industry professionals from the audio, video, lighting and staging markets in Australia. We will be at five major cities including Brisbane, Sydney, Melbourne, Adelaide, and Perth. Please come stop by our booth and check out our exciting products!! We are pleased to announce that USHIO LIGHTING, INC. (Headquarters: Tokyo, COO / Managing Director: Takamasa Kikkawa, henceforth USHIO LIGHTING) acquired 100% of the issued shares of MAXRAY INC. (Headquarters: Osaka, henceforth MAXRAY) under the agreement relating to the acquisition of the shares of MAXRAY, on April 27. Amid the acceleration of the shift toward LED from existing light sources in the lighting market, the synergy between USHIO LIGHTING and MAXRAY going into a Ushio Group, will further drive the expansion of high-value added LED lighting business. Furthermore, Ryujiro Tsubaki took up the position of CEO / Managing Director of MAXRAY on April 27. We are pleased to announce that on March 20, 2015, USHIO LIGHTING, INC. (Headquarters: Tokyo, COO / Managing Director: Takamasa Kikkawa, henceforth USHIO LIGHTING) concluded an agreement relating to the acquisition of the stock of MAXRAY INC. (Headquarters: Osaka, President and CEO: Hiroyuki Yamamoto, henceforth MAXRAY). Under the agreement, USHIO LIGHTING plans to acquire 100% of the issued shares of MAXRAY on April 27. 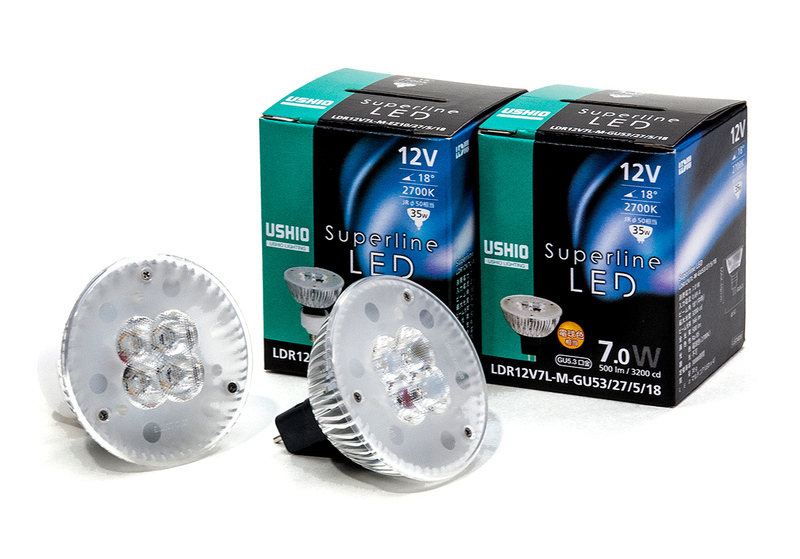 Ushio Lighting, Inc. (Chuo-ku, Tokyo; COO/Managing Director: Takamasa Kikkawa, hereinafter referred to as “Ushio Lighting”) is pleased to announce this release of the new LEDIU＊1 LED lamp Superline LED model of the Superline LED series from January 9 (Fri.). This model is an alternative to the 12 V dichroic mirror halogen lamp (JR) 35 W. With a lamp diameter of 50 mm (φ50), it is the same size. And, it reproduces equivalent maximum luminous intensity and light quality. Superline LED contributes to saving energy and reducing environmental loads, while emitting an attractive light.